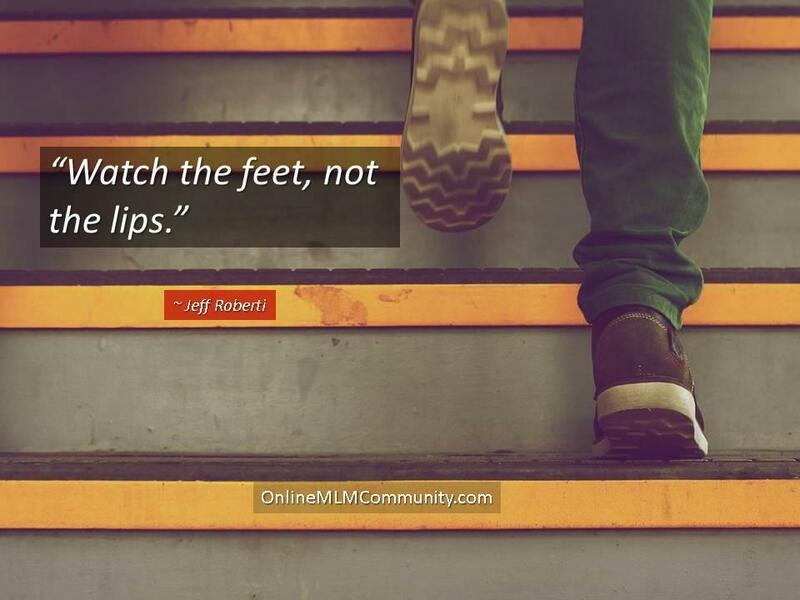 Today, I want to share my Top 50 MLM Quotes of all time that I have found by reading books, watching YouTube videos and just by spending time in this industry. There are a few golden nuggets in here, so please follow along closely. After each MLM Quote, I provide my own insights about it. The quotes are listed in no particular order. The beauty of network marketing is the leverage you get by teaming up with other people. Even if you are a great producer, one person will never outproduce 100 people. Network marketing offers equal opportunity. Anyone can get started. There is very little risk and huge upside potential. What you do with it is totally up to you. Perspective is how you look at things. Successful people tend to be optimistic and look for opportunities wherever they go. The days of job security are long gone. Everyone should be self-employed and take care of their own future. If everything in your business depends on you, you don’t have a real network marketing business. Ultimately, you want a system that runs the business and leaders that take care of their own teams. Always keep your eyes and ears open for sharp, success oriented people. Look for people with contacts and credibility. Pick ONE system for your team to use and do not deviate. As an entrepreneur, you need to get your name out there. Marketing your products, services and opportunity is your real business. If no one knows you exist, your business won’t grow. Give your new reps simple instructions to follow. Have a game-plan for them and work closely with them during their first 90-days in the business. This is such a great quote on time management. Maintain your balance between retailing and recruiting. Remember, the Law of Attraction is always working, either for you or against you. You attract more of what you already are. Until you man up or woman up and take 100% ownership of your business, you will never succeed. Nothing will ever be perfect. Don’t be busy getting ready to get ready. Go out there, make a mess, and learn as you go. Our goal as a sponsor should be to help our people get a check quickly. When someone can hold a check in their hands, even a small check, it will open their mind to the possibilities of what this business offers. Remember that our prospects evaluate us more than they do the products or business opportunity we are offering them. Network marketing is an event-driven business. Attend every event yourself and promote events like your business success depends upon it. Look at what most people in our industry do, which isn’t much, and do the opposite. If you’re going to follow anyone, make sure you follow the leaders. Use a heartfelt approach when you talk to prospects and EXPECT rejection. No matter how good you are at what you do, you will always hear the word NO more than you will YES. This business is a numbers game. You have to contact new prospects every single day, and do it day in and day out. Anything less than five per day will lead to frustration and failure. Fail your way to success. Go for No! Realize that yes is your destination, but no is how you get there. We are really in the people business. We help people work on their personal development, overcome their fears and develop their potential, and they go out and build a business! Whatever it is that you fear, go out and do it. That is the only way you will overcome that fear. The more people you help and serve, the more money you make. That is the beauty of capitalism. Success is never a straight line. You have to keep getting up after you get knocked down. Keep your eye on the prize until you achieve it. The speed of the leader is the speed of the team. A good leader can transform a bunch of misfits into superstars and a bad leader can poison a team of studs. Set your own trail and people will follow you. Great MLM leaders love other people. They look for the good in others at all times. Your level of influence with others will ultimately dictate where you end up in life. Set high standards and focus on continuous improvement whenever possible. Good leaders find and develop other leaders. 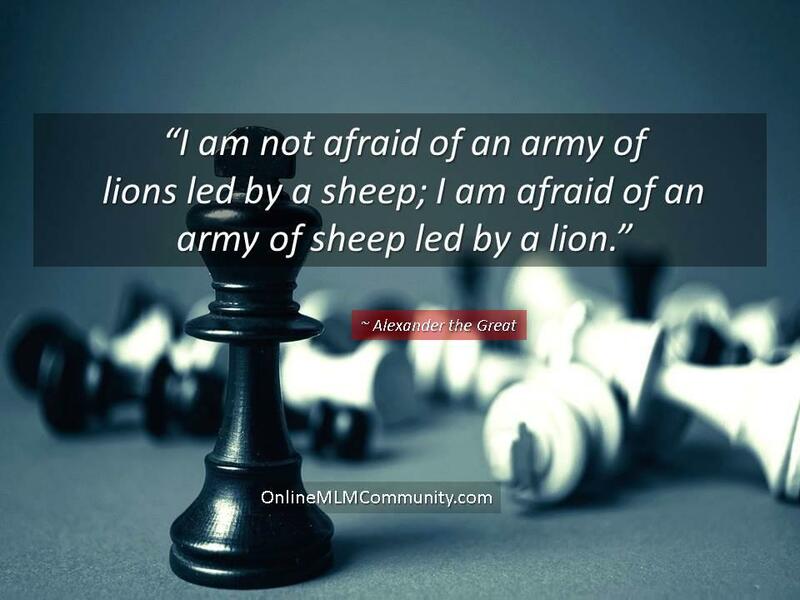 If all you have is a bunch of followers on your team, you aren’t a great leader. Be interested, not interesting. Whenever you talk with someone else, make sure the conversation is about them, not you. Your greatest successes normally come after your greatest defeats. You never succeed your way to success. Instead, you fail your way to success. Nothing ventured, nothing lost. Set big goals and even if you come up short, you will still have achieved great things. Work on your personal development daily. Your real education begins after you graduate college. You must have self-discipline if you want to succeed in this business. You must do the things you know you should be doing, even when you don’t feel like doing it.. There is never a perfect plan. Just get started and make adjustments as you go. This business is about sponsoring and teachers. It’s vital that you help the people you sponsor get someone signed up quickly. This is the law of averages working itself out. The numbers in this business never lie. Most do nothing. A few do a little. And a really select few do a lot. Our job is to sift and sort through our prospects, not sell and convince. Set clear goals for your business. Have a daily action plan. Never wing it! Our job is to find customers and reps. Our real money is made on repeat orders, not one-time orders. This is one of my favorite MLM quotes. However you approach people will dictate the type of people you attract into your business. At the end of the day, you are looking for two to five quality leaders to work with and build a dynasty with. This is one of my favorite quotes on this list. Most people will never save one million dollars in their lifetime, but anyone can build up a $2,500 per month residual income in network marketing, within a few years, if they put in the work. Talk is cheap. Anyone can talk a big game, and most people do. Your job is to look in your back office to see who is producing results and then go out and work with that person. Work with the willing. Don’t try to drag anyone across the finish line or make anyone successful. Look for people who are coachable, hungry and willing to work. Take the time to learn and study marketing. Other than leadership, it is the single most important skill to master if you want to succeed in this business. If you take your time and read over each one of these quotes closely, you will discover some great things you can apply to your network marketing business. Once again, these are my Top 50 MLM Quotes of all time. I hope you enjoyed them. If you have a quote that you would like to share, just leave a comment to this page. Also, I’d love to hear which quote on this list is your favorite one. Thanks. • 80 to 90 percent of everyone you recruit in a company will quit or drop out in 6 months or less. • The system needs to provide immediate cash flow while the downline showed up. • MLM Programs only pay, on average, about $2 to $8 per active person on your team per month, so you need a HUGE team to make any type of substantial income. • All home business owners need leads. • People are terrified by the idea of selling. • The internet is not a marketing system. • The internet is a tool. It’s a great way to communicate and share information, but it’s not a system. • To stay in business, and make lots of money, you have to add value to people’s lives. • I would offer free information and let the tools do the selling. • The rich possess absolute control over their thoughts. • College teaches people how to work for the rule breakers and risk takers. • Rich people have assumed massive responsibility. Broke people actively seek to avoid responsibility. Here are a few more MLM Quotes I thought might inspire you. My Take: When you are talking with people, appeal to their emotions. Focus on the benefits, not the features. That is the smartest way to sell. This week’s quote of the week is from Mark Yarnell. His quote talks about the value of building customers from your warm market. Here is what he said. Build a customer base among family and friends prior to building a downline. In other words, start out by talking with the people you know and leading with the products. This helps you make some immediate profit and gets your business off the ground. You can always upgrade some of these folks into happy customers in the months to come. One of the best things you can do is put yourself in your prospect’s shoes. Think of things from their perspective and you will close more sales. Here’s a quote from Napoleon Hill that should make you think. “Anybody can wish for riches, and most people do, but only a few know that a definite plan, plus a burning desire for wealth, are the only dependable means of accumulating wealth.” The bottom line is you need a plan of attack and a strong burning desire to succeed at anything. You can’t wish your way to success. As I see it, most people want to belong to something much bigger than themselves. They want to be part of a winning team where they feel like an important contributor to the team. The key takeaway is to create a winning culture in your team that everyone wants to be part of. Do that and fewer people will drop out. This is a quote from Mark Yarnell. This is a quote by A.L. Williams, founder of Primerica. My Take: Network marketing is not about you; it’s about the other person. When you shift your focus from yourself to helping another person, you can accomplish some amazing things. My take is that you don’t succeed your way to success. Instead, you fail your way to success. Just get up one more time than you are knocked down. My Take: Be a student of what you do. Seek knowledge and you will find it. Never act like you know everything. My Take: Don’t confuse the busy work with the productive work. Anyone can be busy, but successful people are productive. In this great industry, there are only a few tasks that will actually grow your business. This includes retailing and recruiting. Everything else should be done after those tasks. Spend 90% or more of your working hours on retailing and recruiting and you will be successful. My Thoughts: At the end of the day people only care about what’s in it for them. As a sponsor, your job is to put your prospect’s needs first and show them how your products or business can help them solve one or more of their problems. Only then will they consider joining. My Thoughts: Get people to events. Events are so powerful. Many people make the decision to “build it big” while at a company event. Attend all events yourself and promote them like crazy with your group. My Take: Use testimonials to help you attract more prospects and close more sales. Remember that your job is to sift and sort through people, not sell them. Ideally, you want them to sell themselves on what you are offering them. My Take: This quote is from the book I recommended above. At the end of the day, you need to learn how to appeal to people’s emotions. Once you find out what your prospect REALLY wants, you can use that to your leverage. Focus on benefits, not features. Get good at telling stories and drawing the prospect in. Don’t bore your prospect with facts. Focus on their hot button instead. My Take: I’ve heard this quote so many times now and it is definitely true. Be so busy with your actions that you don’t have time to make excuses. That is a quote from million-dollar earner Sarah Robbins. The beauty of network marketing is that two or three good people really can change your life for the better. You never know who those people will be or when they will show up on your team! Most top earners make most of their income from just one to three key people in their team. My Take: So many people are getting ready to get ready. They think about their business all the time. They spend time working in the business, but they never focus on the activities that actually grow their business. Avoid analysis paralysis at all costs. Spend all of your time on the money producing activities. Don’t think that spending time on conference calls, webinars, Facebook or YouTube will actually grow your business. My Take: Take your eyes off yourself and focus your efforts on helping other people get what they want. My Take: Mark (now deceased) was one of my most trusted mentors. When you look at the top earners in any company you will quickly discover that most of them sponsored 100 to 200 people personally and typically three to five of those people went on to build it big. Most people do nothing. Some do a little. A select few are consistent. And 1-2% will be responsible for 90% or more of your income! My Take: Realize that not everyone will be serious. Realize this is a business of attrition. Accept that most of your team will do little to nothing. Love on everyone. Be nice to everyone. Appreciate everyone. Meet people where they are at. Never pressure anyone to do more than they want to. But spend your time looking for and helping the 10% and the 2%. That is the best use of your time. My Take: Network marketing is a team sport. You cannot be successful until you help other people on your team become successful. The more people you help achieve success the more money you make. My Take: Most entrepreneurs fail several times before they succeed. You can’t be scared to fail. It’s inevitable. When you do fail, learn from your mistakes and prepare for victory. My Take: Who you choose as a sponsor is just as important as the company you choose. Choose wisely! My Take: If you follow this advice you would personally sponsor 240 people over a five year period. That’s sponsoring less than one person per week. Anyone can do that if they have a game plan and some discipline. This is a quote from top earners John and Tiffany Malott. My takeaway is that you need to create a team culture in your organization, something that people are proud to be part of. You have to realize that everyone wants to belong to something bigger than themselves and feel like they are an important part of the team. People like to associate with groups of people who have similar goals, desires and interests. My takeaway from all of this is that you need to come up with your own system that leverages your own natural talents and abilities AND you need to take massive action. Only then will you succeed in network marketing. You should also have a system that your new team members can use, but it would be much wiser to help each new member come up with a strategy that works for them. This is a great quote from Mark Yarnell (Your Best Year in Network Marketing) and I agree with him entirely. In our industry, there are two mindsets. The first mindset is that you should have one system for your team and have everyone on your team build their business the exact same way. I’m personally not a fan of that system. I learned a long time ago that everyone is different. Some people are extroverts. Others are introverts. Some are techies. Others are people-people. Some people want to do home parties. Others don’t. Your real job as a sponsor is to sit down with each new team member and find out what they are naturally good at. Help them make a list of talents and strengths and then help them develop a game plan to build their business that leverages those talents, abilities and strengths. Trying to make everyone do the exact same thing is foolish. It might work in a franchise, but it seldom works in MLM. If you were to look at any top leader in any company, there’s a good chance they didn’t build their business the same way their successful upline did. And there’s a good chance, their successful team members didn’t follow their system. By all means, have a system. But don’t be so foolish to think that everyone must follow it to be successful. My take on this is that people who are long distance from you are forced to take responsibility for their own network marketing business. You aren’t there to coddle them or baby them or do everything for them. This forces them to become a leader if they want to build a successful business of their own. My Take: This is so true. You attract more of what you already are. People join your team because of the value they perceive that you have. Improve your skills, quality, and success and you will attract better quality prospects. My Thoughts: This is a sponsor and teach business. Your objective as a sponsor is to work with the people on your team and help them become successful. You need to find a few key players who want to build it big and then you need to shift your efforts to helping them succeed. My Take: You have to realize that most people want to belong to something bigger than themselves. Many folks join our industry to make new friends and have a social club to belong to. Have fun with your team. Don’t take yourself too seriously. Spend quality time with your team laughing, learning and growing. I love all these quotes. Many of them I have written down and saved myself. #3 was told to me by my uncle when I first joined my current company and he knew I was serious. Thanks for taking the time to share these! I’m glad you liked the quotes, Kathy. #1 by J. Paul Getty says to me work smart, not hard. #3. I must add one more class… Those who thought, did and quit before finishing. #6. I am in total agreement with this quote. If the organization knows you and needs you to survive, too much is on your shoulders and failure is imminent. #12. Yes, if you are a great person, those behind you will want to be just like you. All of these are great quotes. I believe you could make articles around each and every one. That’s a great idea. Maybe I will do that. I have a question Chuck: In the 2nd quote Robert Kiyosaki mentioned network marketing in the B quadrant. What exactly is the B quadrant? I may be asking a stupid question, but the real stupid question is the one that isn’t asked. I really like number 14 too. Don’t wait because the time will never be completely right. This is so true. So many of us procrastinate thinking that there will be a better time, but it never comes. The B quadrant is owning a business that doesn’t require you to run it.